Update: The acquisition announcement may spill nicely into a formal Twitter Music announcement, according to a Thursday evening report. Sources speaking with AllThingsD said Twitter plans to launch the standalone Twitter Music app Friday, while another source noted the app is coming to coincide with the start of the popular Coachella music festival, which gets underway in California this weekend. That source said Music's launch may not necessarily happen Friday. According to the publication, the app suggests artists and songs based on a "number of personalized signals," including followed Twitter accounts. Users will apparently be able to listen to song clips from within the app, use third-party services like iTunes and SoundCloud, plus watch music videos thanks to Vevo. We Are Hunted on Thursday announced that it's ditching its independence and joining Twitter, making good on a report from last month that said such a deal had happened. Twitter backed up the news with a welcome tweet to the online music discovery service. "There's no question that Twitter and music go well together. Artists turn to Twitter first to connect with fans, and people share and discover new songs and albums every day. We can't wait to share what we've been working on at Twitter." Last month's report dropped "Twitter Music" as the name for a purported Twitterific tune app, and this purchase looks to be part of the social network's master plan to break into the music biz. What's been said about Twitter Music is that it pulls recommendations based on Twitter followers, emerging artists and from selections tagged with a #NowPlaying hashtag. It's also believed that users won't need to have Twitter accounts to use the service but will serve as a standalone iOS app. However, none of these features are confirmed. 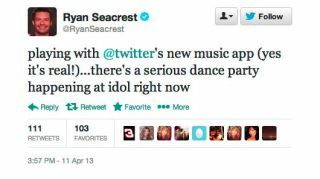 Despite the lack of a formal announcement from either company, the web caught a tweet from none other than professional talker Ryan Seacrest that basically confirms the app's existence. He also tweeted a musician with some of the app's details: "lovin the app...shows what artists are trending, also has up and coming artists..."
What's more, the We Are Hunted Twitter account tweeted @RyanSeacrest the above message, and CC'ed the @twittermusic account. Twitter Music took the time to retweet Seacrest's blast, continuing the spread of app appreciation and apparent confirmation. Why bother with an official announcement when you can rely on the host of "American Idol" to give you public props?